Join us for our celebration of 175 years of Celestine Thursday June 28th through Sunday July 1st, 2018 on the grounds of St. Celestine Church in downtown Celestine. Join us for our celebration of 175 years of Celestine Thursday June 28th through Sunday July 1st, 2018 on the grounds of St. Celestine Church in downtown Celestine. We welcome everyone to our small town located near Patoka Lake on the east side of Dubois County Indiana. Our annual Streetfest is known for days full of fun events, great food, enjoyable music and most of all, lots (and lots) of friends & fellowship. Most events, food and drink will be located in the flat east parking lot between the church and fire station. Parking will be all around the community and hillsides - watch for signs. The west side of church is available for parking with a focus on handicapped and elderly. We will have a shuttle running people up the hill from around the community. We love our small town and want to have a BIG party to celebrate our 175th! JOIN US! Everyone is welcome to get involved with the planning and work related to the 175th. We are looking for people with ideas and the desire to make our event as great as possible! We meet every month on the 1st Thursday of the month at 7pm in the basement of Happy Sports Bar and Grill - JOIN US! Check out the ad that will be airing on channel 7 and 25! Fire & Ice - Playing 50’s through today’s rock, pop and country hits for dancing fun! Celestine 175 is a free to attend event, all ages welcome. We hold the annual Streetfest and our 175th to raise money for the needs of the Celestine Community & Charitable Organizations. 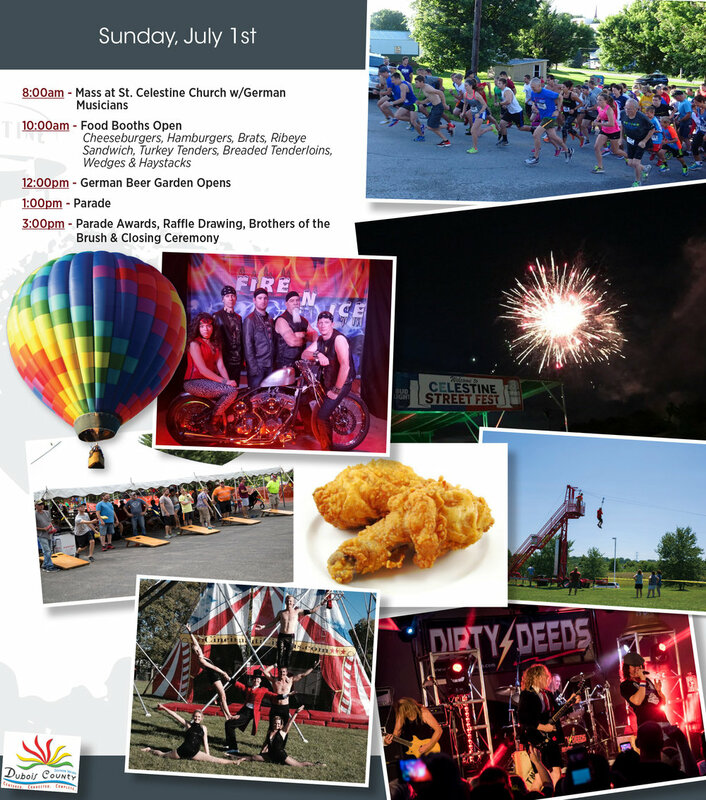 Funded in part by the Dubois County Visitors Center – www.visitduboiscounty.com – 800.968.4578 - Visit them to learn about other events and attractions in our area! Further information and updates are available on our Facebook Page - Give us a like and follow us! Use our interactive map below to learn where your favorite event will be held! Tip - Use the box icon on the top right of the map to open it up into a new/full size window. Use the box icon on the left to open a side bar with a list of activities and locations. Clicking on anything will load a description of the details. Be sure to zoom in on the map to see more detail! Click HERE to go to Google Maps to view. More maps and details (including parade routes) are available HERE. You have never seen Celestine like this! In celebration of the 175th BC Baggett and Indiana Drones have put together a gorgeous video of the Celestine community along with footage from the Fire Department Tractor Pull & St. Isidore Shooting Match at the Celestine Community Club. Uploaded by BC Baggett on 2018-03-26.